The Meyer lab is currently looking for a PhD student for fall 2019. More information here. We are also looking for undergraduate students interested in research. For more information, please email Néva Meyer. Welcome to the Meyer lab! Our lab is interested in understanding how nervous systems evolved. Nervous systems are complex, highly integrated animal organ systems capable of storing information (memory), sensing the environment, controlling behavior, and processing and integrating multiple types of information simultaneously. Multiple groups of animals throughout the Bilateria possess centralized nervous systems – vertebrates have an anterior brain and dorsal nerve cord, whereas annelids (segmented worms) and arthropods (insects and crustaceans) have an anterior brain and a ventral nerve cord. However, the earliest branching animals (e.g., comb jellies and jellyfish) have non-centralized nervous systems, or nerve nets. A centralized arrangement of neurons may allow for more sophisticated processing of information and thus, exploitation of new habitats and evolution of new lifestyles and body shapes. I am interested in understanding how CNSs arose in different animal groups and how these CNSs compare with one another. 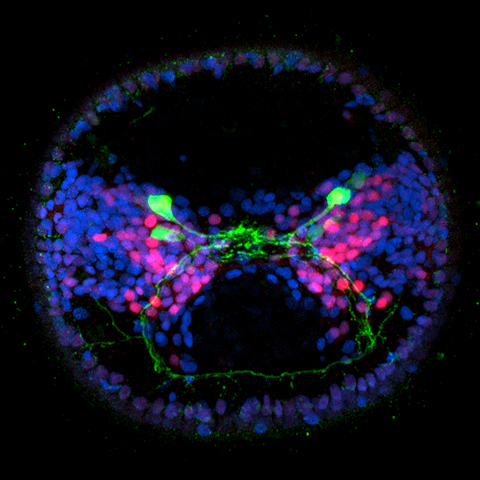 Most of the modern molecular descriptions of neurogenesis come from only two of the three major bilaterian clades, the deuterostomes (e.g., vertebrates) and the ecdysozoans (e.g., arthropods). There remains a huge gap in our knowledge of central nervous system development in the third bilaterian clade, the spiralians (e.g., annelids). By studying central nervous system development in annelids, my lab hopes to make significant contributions to our understanding of the basic mechanisms of neural fate specification and neurogenesis in annelids and ultimately to our understanding of body plan and nervous system evolution in bilaterians. One major goal of our research program is to elucidate the molecular and cellular mechanisms driving neural fate specification during brain and ventral nerve cord development in the spiralian annelid Capitella teleta. To learn more about our research, visit the “Research” page above. I teach Neuroscience (BIOL 143), lab courses in Developmental Biology (BIOL 221/321) and Comparative and Human Physiology (BIOL 240/340), and a seminar course in Evo-Devo (Biol239/339). BIOL 143 is an introduction to neuroscience that explores the biology of nervous systems and their relationship to behavior and disease. BIOL 221 focuses on the processes by which a fertilized egg gives rise to a multicellular organism with organs, tissues, and cell types that are structurally and functionally distinct and are arranged in a characteristic three-dimensional body plan. BIOL 240/340 is an introduction to the physical and chemical functions that maintain animal, including human, life. Finally, BIOL 239 covers a broad range of topics in evolutionary developmental biology, or “evo-devo”, which is a fascinating field of biology that integrates organismal evolutionary biology with molecular embryology, genetics, and genomics. The goal of evo-devo is to elucidate how changes in developmental processes have given rise to the incredible biological diversity seen in nature.